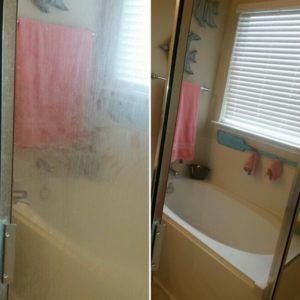 There is nothing tougher than cleaning those glass shower doors. It seems no matter how much you scrub them they just do not seem to get clean. The secret to our success in cleaning these soap scum covered glass doors is vinegar. Yup! You heard right. We spray our non-diluted vinegar on the glass surface and let it sit for at least 30 minutes. The acid in the vinegar breaks down the soap scum and we revisit after time has passed and are able to wipe the soap scummed surface clean. By spraying your shower after each use with non-diluted vinegar it will help to prevent the buildup of soap scum in the future. Maids and Moore have specialized in cleaning for 11 years and with many years of experience becomes the success in our techniques for cleaning and providing 100% quality and receiving 100% satisfaction from our loyal customers.